Client doing Sahrmann Progression exercises. In 2018, I am starting to focus more on working with clients that need assistance with their post-physical therapy needs. I was approached this year by a Fort Collins physical therapist that was working with one of my existing long-term clients to see if I was interested in taking on more post-physical therapy clients. After thinking about it, it made sense for me to help these existing patients of the physical therapist. Since physical therapy benefits eventually run out due to insurance limitations, it was a logical fit to help these patients continue to progress in their programs. Dennis is simply a life saver. 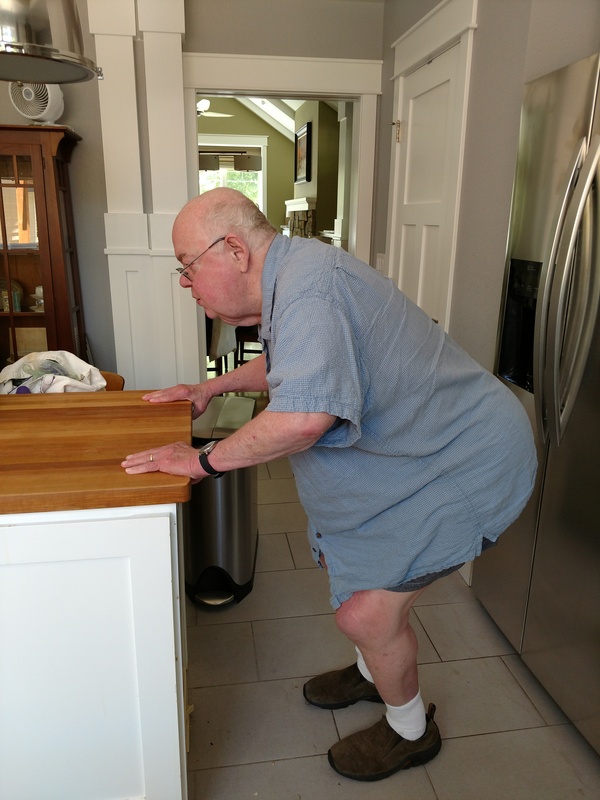 After double knee surgery, followed six months later with surgery to repair a torn quad and 15 months of physical therapy, I needed a personal trainer. My wonderful and experienced physical therapist said he had done all that he could do. I had good mobility, but my quad was still weak. He urged me to join a gym or find some other way to strengthen my quad and build my endurance. My spouse was going through physical therapy with a different physical therapist. In discussing my situation with her therapist, the therapist recommended Dennis. After a little due diligence, I visited with Dennis and decided to start a program with him. I knew I needed to continue to improve my physical condition, but I have not had great experiences with gyms. The personal trainer concept made a lot of sense to me. I have been working with Dennis twice a week for three months, and I couldn’t have asked for a better solution. I was spending a lot of time driving to my physical therapist, having a session and then driving home. Dennis comes right on time to my home saving a lot of time, and I am able to work in a comfortable environment. Dennis is demanding but very fair; always asking after set of exercises if I am doing okay with the movements. He is very bright and frankly delightful to work with every session. There are no gym fees or lost time traveling to a gym. His fees are extremely reasonable. I work with the therapists at Advance Spine Physical Therapy to come up with comprehensive post-physical therapy plans that benefit their patients. I go to the homes of these patients to continue their programs to achieve the best possible outcome in continuing their therapy. They do not need to join a gym or purchase any special equipment to help with their therapy. If you have been discharged from your physical therapy program and would like to continue progressing toward maximum wellness, please visit my contact page to set up a consultation. We can discuss what you have done and how we can keep you moving forward. If you are a current physical therapist in Fort Collins or Loveland and would like to discuss how I can assist you and your patients, please give me a call at 970-691-5789 to schedule a telephone conference or a one-on-one meeting.